We’ve talked about raising awareness through newsjacking before. But lately there have been so many non-profit bloggers offering great examples of newsjacking that we thought it warranted another post. From the Olympics to the Oscars, bloggers have found imaginative ways to “piggyback” on current events or breaking news (such as the Sochi Olympics and the Academy Awards) in order to amplify their message. Here’s a round-up of recent posts to inspire your non-profit or membership newsjacking gold! Please take this opportunity to channel the spirit of the Olympics and give your donors their moment in time. Without them, your mission would fail. Your vision would perish. They’ve earned a gold medal. The simplicity and brevity of her words and the passion of her delivery shouted authentic.Yes, she must have rehearsed her speech a few times or more. But she remained completely authentic. Nothing that connects more strongly than that. Anyone who watched the Academy Awards show live knows that the host, Ellen Degeneres, organized a selfie with a group of front-row, a-list actors and tweeted it live. Later Ellen noted that all of the retweets of this selfie had “broken Twitter”. Afterwards a number of organizations, took their own group selfies and shared them with the hashtag @TheEllenShow. You can see some of the folks who posted their pics on Twitter here. Other organizations newsjacked the actual Oscar selfie to get their community talking. 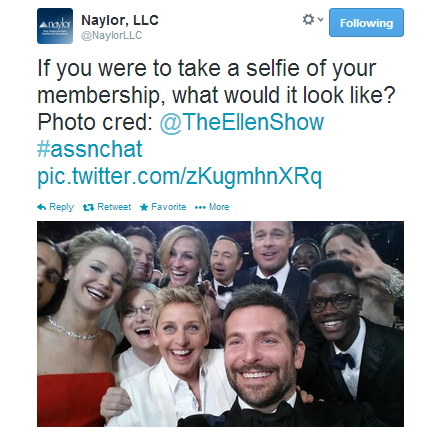 For example, Naylor LLC offered up this question: If you were to take a selfie of your membership, what would it look like? While Ellen might have broken Twitter records with her selfie, John Haydon reminds us that non-profits were also using Facebook to mark the Oscars and promote their causes too. In a recent post John outlines The 5 Nonprofits That Newsjacked on Facebook During the Oscars. Sometimes a trending story is directly related to your community. Sometimes a trending story has nothing to do with your community, but everyone is talking about it. 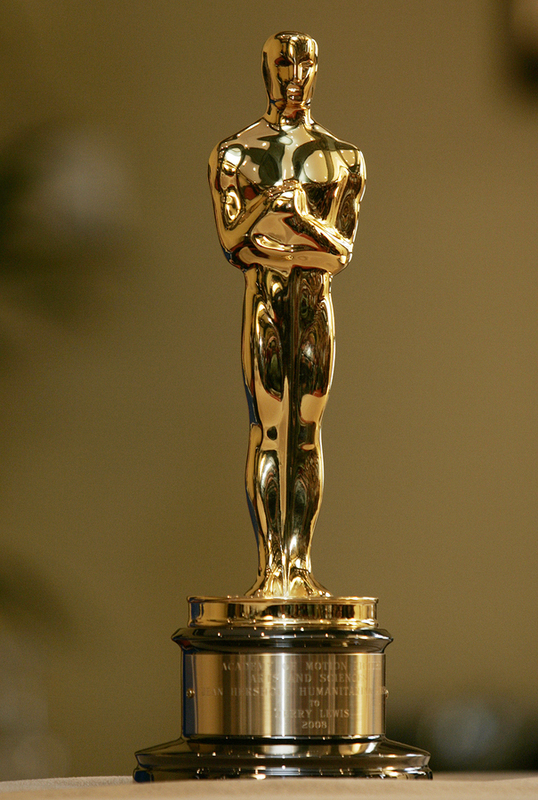 Like the Academy Awards. To find out more about these organizations’ oscar-worthy Facebook newsjacking - check out John Haydon’s post. 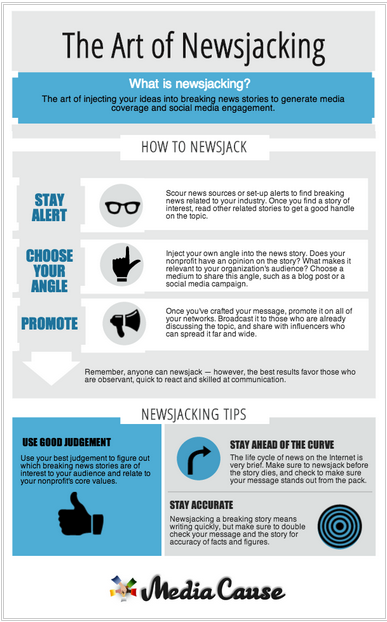 So if you think it’s time your non-profit or membership organization tried newsjacking, you should check out the infographic: The Art of Newsjacking (click on the image to see the full post). Has your organization used newsjacking lately? Let us know about it in the comments below. Joan Garry (former GLAAD ED) also did this, tying in the Oscars and Ellen DeGeneres. Ack - didn't realize I couldn't put in a link. Thanks Scott - great post: The Five Attributes of a Great Executive Director.